Is It OK To Let Your Cat Go On The Balcony? Cats have always enjoyed a mystique that borders on the supernatural. There's something downright otherworldly about these slinky, staring, enigmatic animals. But let's get one thing straight. A cat jumping from the top of the refrigerator and landing on his feet is natural agility. A cat jumping off an upper-level balcony and landing on his feet is magic. And cats, despite what many of us may suspect, are not magic. They're flesh and blood and bones and they have just one, not nine, lives. Just ask someone from your local animal control department. "Based on the fact that we've picked up cats who have fallen off balconies, we recommend that they're supervised or harnessed in a safe way that they can't get off the balcony," Karen Edwards of Hamilton Animal Services in Ontario, Canada, tells The Dodo. In fact, falling cats are so common, veterinarians have coined a name for it: high-rise syndrome. And as growing cities expand upward, the term will likely become more common. Which is why experts urge cat owners to keep furry friends indoors. Or on a leash. Or get even more creative and cat-proof your balcony. But be warned, while things can be dog-proofed, toddler-proofed and even idiot-proofed, making them cat-proof is a whole other level of complexity. Cats may not be magical, but they probably could solve a Rubik's Cube faster than you ... if they were so inclined. Some people are building balcony playgrounds for their pets and aptly calling them catios. You can find out how to make your very own here. But if a catio seems like too much bother, consider the timeless simplicity of a leash. 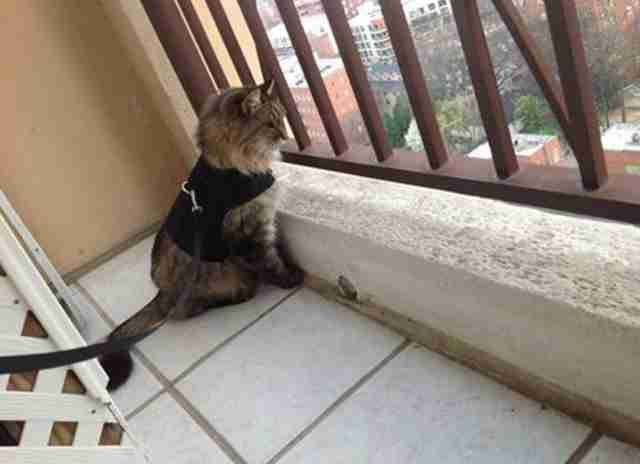 That dapper cat is wearing a walking jacket made from soft, lightweight material. And that jacket is hooked to a tether. Regardless of what method you choose, it doesn't mean much without one crucial ingredient: you. Edwards says pets should never be left alone on balconies. They're very easily distracted. And when something catches their fancy, they tend to go for it. "We've seen cats jump off balconies trying to catch a butterfly or a bird or whatever passing by," she says. And if that leash has a little too much give, a cat could find himself dangling. Alone. Another reason to keep an eye on your cat? The weather up there. "Cats should never be left alone on balconies without having a pet door or some other way of getting back inside the home," Sonja Olson, a senior clinician in emergency medicine for BluePearl Veterinary Partners, tells The Dodo. "If your cat spends a lot of time on a balcony, it's best to have the balcony screened-in if that's possible. But even with a screened-in balcony, cats should not be left alone there without a way of getting back inside. The heat or cold could be too much for them." Also, think about what other, bigger animals could be passing through the neighborhood. Not all of them possess the sublime sense of chill of this bald eagle. Olson offers another underrated tip: Cats who have been spayed or neutered are less likely to roam. But always keep pets microchipped, just in case - true to their crafty cat nature - they still manage to escape. Looking for more tips on how to keep your cat safe outdoors? Click here.